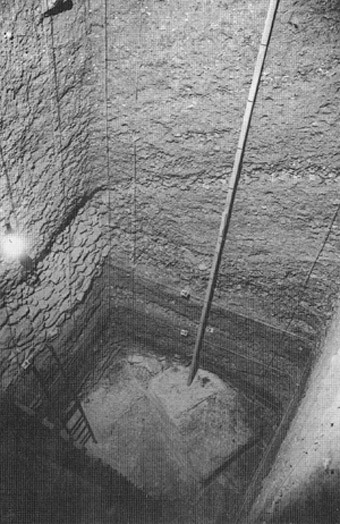 The sounding under the Church of the Redeemer goes down to a former quarry that was in use until the 1st century BC. In this area was also found a garden area of Jewish Jerusalem (1st century AD) and the vast layers of rubble from the time of the founding of Colonia Aelia Capitolina (2nd century AD). The sounding reaches down to the natural rock. There, in an area of 2.90 x 3.60m, are the signs of an old quarry. The broken ashlars measured between 0.60 to 0.90m wide, 0.90 to 1.10m long and 0.60 to 0.70m high. 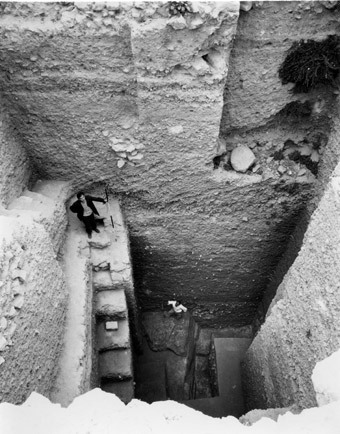 This quarry was mentioned first by C. Warren (Muristan excavation), then also C. Schick (Alexander Hospice, later Muristan excavation), H. Vincent and finally K. Kenyon ("Area C"). It has now become clear during the course of further excavations in the Church of the Holy Sepulchre that it must have been a huge quarry site, which must have spanned from David Street to under today’s Holy Sepulchre and Alexander Hospice. But unlike in Kenyon’s "Area C", there was no closed layer with finds from the 7th century BC lying in directly on the quarry. The quarry in the area of the Church of the Redeemer will therefore have been used until the 1st century BC. The approximately 2m-thick layer of soil above the natural rock is not of uniform nature. Several (at least three) horizontal layers were deposited here over each other, probably with considerable time intervals. The top layer and the stone wall in the north of the sounding limit the stratum. They have been described by the excavators as a garden. The soil here was plowed 20cm deep. The wall was probably used to partition the land. It is likely that here several garden areas lay side by side. This matches very neatly the name given by Josephus of the nearby city gate in the northern section of the "First Wall" as "Gennat Gate" - "Garden Gate" (Bell 4.2 V § 146). 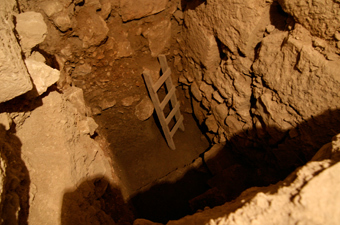 There are many indications that Nahman Avigad has already correctly located this gate structure during his excavations south of David Street in the Jewish Quarter. The quarry may have been used both for the construction of the Old Testament city expansion south of present-day David Street at the end of the 8th century BC, and for the later construction of Herod’s Quarter in the 1st century BC. A 5.50m-thick layer of debris was dumped onto the former garden area in around 135 AD on the orders of emperor Hadrian. This corresponds to the 8m-high embankment in Kenyon’s "Area C". The aim of this measure was already indicated above: because Hadrian wanted to extend his city Aelia Capitolina to the northern extent of that of Herod Agrippa I in a way that made architectural sense, he had to fill in the former quarry site, including the roughly 100m-wide valley that extended from east to west. The fill material consisted of rubble that Hadrian had fetched from the city that was destroyed by Titus in AD 70. Remains of walls, bricks, pottery and plaster were piled up here, and the date is evident from the fact that the latest coins found here are from the time of the first Jewish Revolt against Rome (66-70 AD). The slope of the layers beneath the Church of the Redeemer points to the area having been filled from the south. The material was probably brought from the other side of David Street and dumped here toward the north. This explains also the intermixing in these layers of the 1st-century AD material with that of the Iron Age, i.e. from the time of the Old Testament, because the buildings of the Jewish city of the Hasmoneans was founded directly on the ruins of the Old Testament city extension of King Hezekiah of the late 8th century BC. Thus a surface was created out of the lowest layer of the east-west wall now visible in the excavation, together with other smaller walls that run perpendicular to it. The surface consisted partly of mortar, partly of rammed earth with insignificant building remains and stood next to the large Roman temple that Hadrian had built in what is now the Muristan.